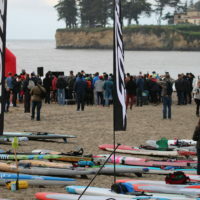 Weeks before the Santa Cruz Paddlefest eager paddlers from all over the world start watching the long-range forecasts. 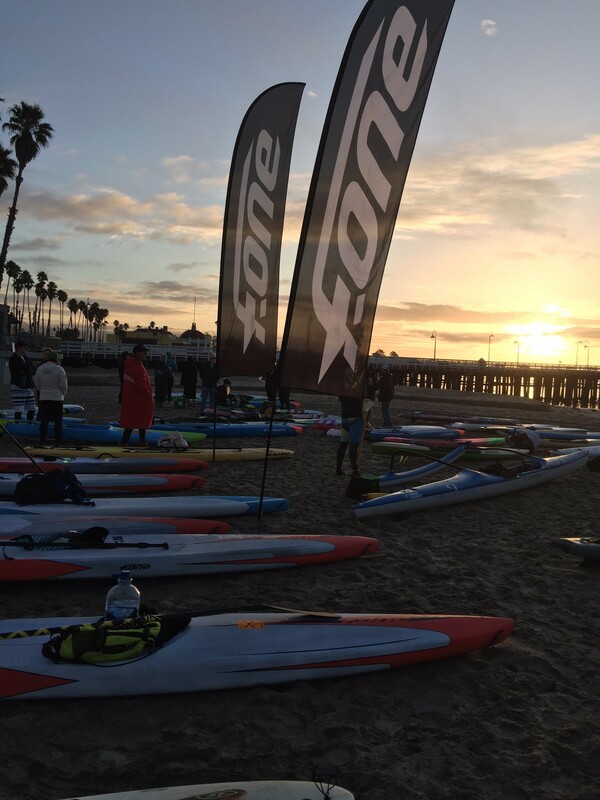 The months leading up to the Paddlefest had California doing its best impression of summer. ‘Sum-bruary’ people were calling it. 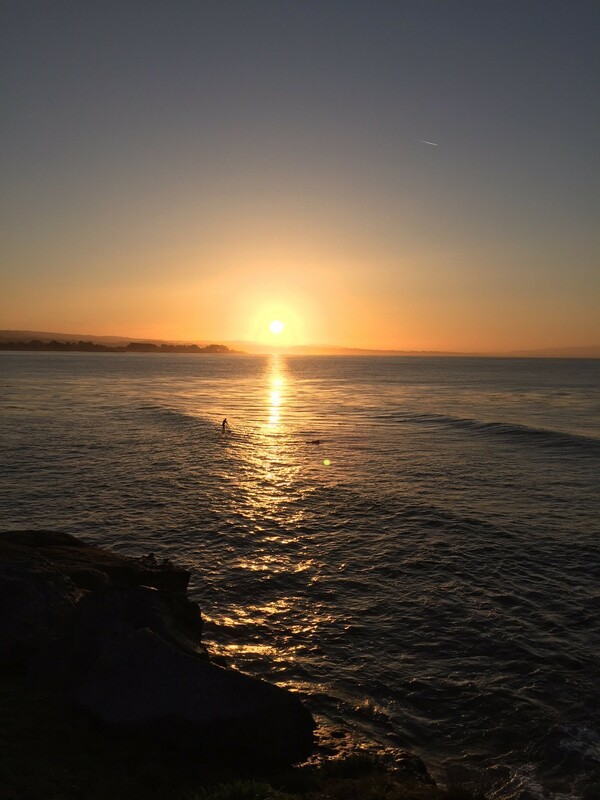 The weather was warm and if you lived south of San Francisco there was virtually no swell. Then March hit and the rain started. Rain on and off day in day out. With rain comes south wind, easily the worst wind for Santa Cruz. The forecast was showing swell and rain. No rain. Lots of swell. Less swell. Rain. South wind. It changed daily. 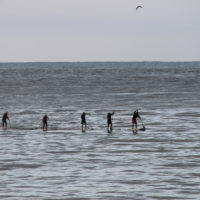 Wednesday March 21st saw conditions that ranged from, “This is the worst surf I’ve ever seen,” to “From the looks of it the ocean won’t smooth out for weeks.” That was paraphrased. Thursday, and it’s a day before the event. 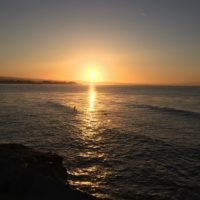 South winds and heavy rain battered the coast last night and the storm is sitting over Santa Cruz. The morning report cannot be transcribed. Regardless, the event was scheduled, and it was starting Friday no matter what. No waiting period here. 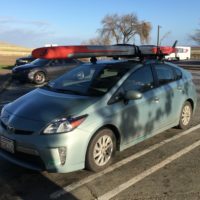 John Hadley’s Prius – hence how he got the name Priusman! Not surprisingly, the Prius handled the rain and the road conditions like an Indy car even when a giant tumbleweed rolled in its path. More interestingly, who runs into tumbleweeds in winter? In Oakland? Yes, Oakland. 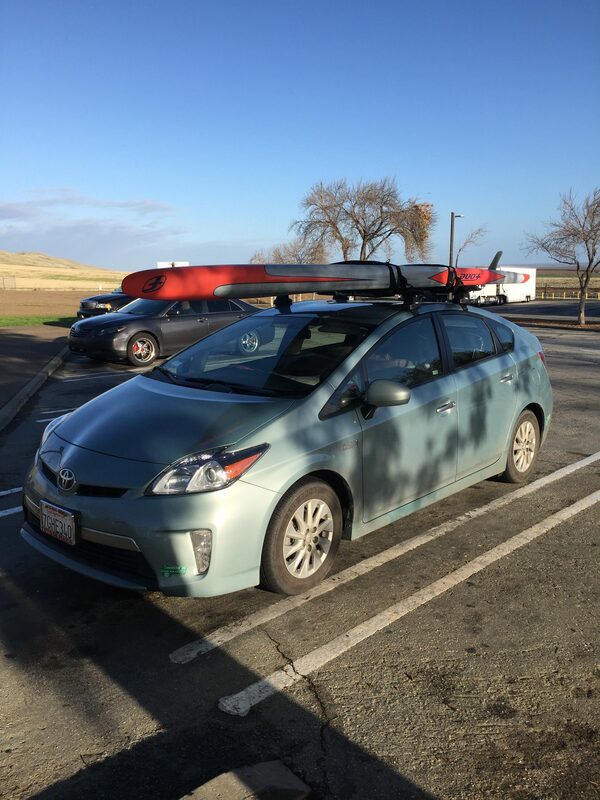 Anyway, back to the storm fest and the arrival of the Prius at the Paddlefest. 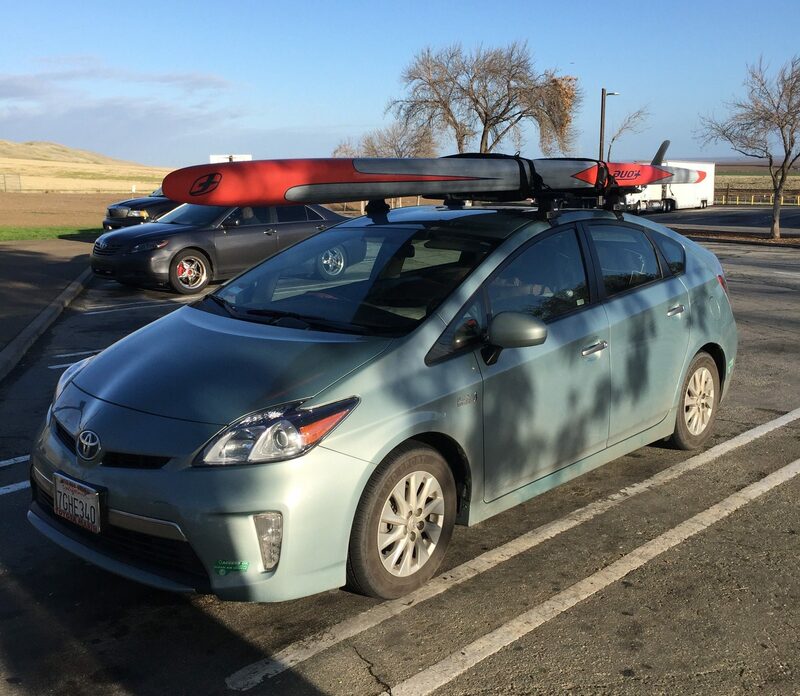 As the Prius, decorated with a fine looking F-One 14×25.5 race pro, rounded the corner the sky cleared, the wind switched, and the waves looked fun. First, Handshakes and hugs were dispersed to Billy, Josh, and Poe then I responsibly checked into our house thus ending my sense of responsibility for days. 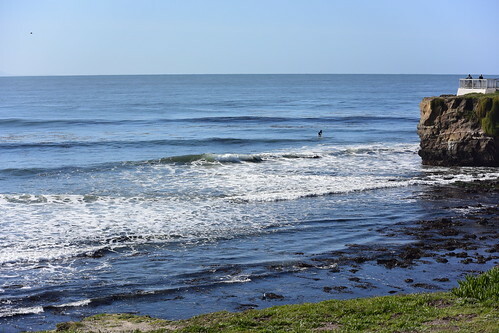 Then I threw the wetsuit on and ran down the steps for a three hour surf. The south winds had yielded to the favorable northwest winds and it was game on. Day one heats were posted and every heat was stacked. The odds weren’t looking good for the average Joe, John, Phil, or Jeff. Bluerush and F-One ripper, Phil Tressenrider started off the day with a good heat nabbing some good waves on his way to a solid second. Then Haakon went to town on his heat with a newly styled and neatly manicured facial growth, clearly a sign that teenaged Haakon is gone and man Haakon is here. Zane Schweitzer was in my heat and he was a bundle of nerves looking at my hat. He knew he was in for a tough heat and I had him dead to rights when the heat started on account of getting a wave right at the buzzer. Unfortunately, there were still 18 minutes and 49 seconds left for him to dismantle the next five waves which meant the heat went to him. 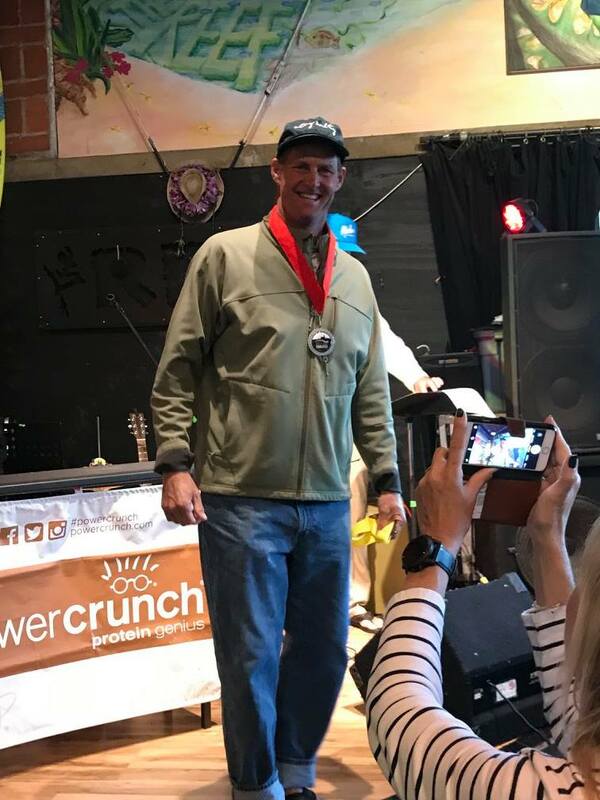 I was happy with second. Josh was busy unwrapping his board when he realized his heat was coming up. 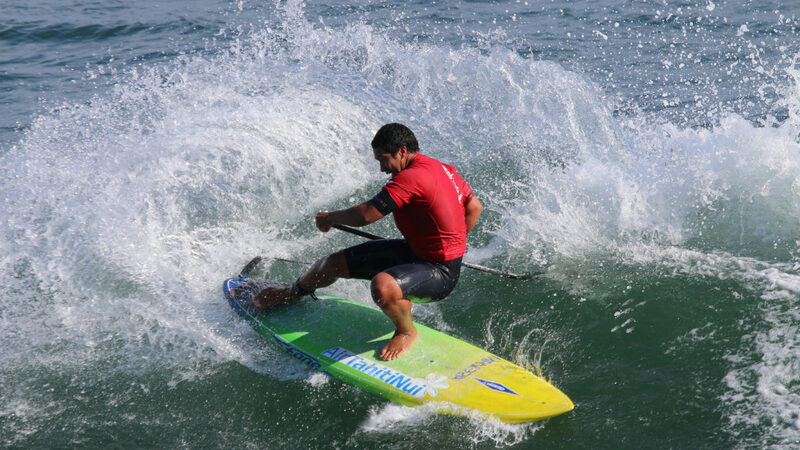 His new 8’0 x 24″ Anakao looked solid as he ripped turn after turn basically gouging his way to a solid first. The next heat saw Poe sinking his board up to his waist before doing a few turns that left the crowd silenced. Poe is a man of few words who lets his surfing do the talking. He took first, and the waves were scared! Over at Indicators, Kitsy and Alex had decided to do a little race training and catch a few waves on their race boards. That inspired me to do the same and it was FUN. Riding a 12’6 or 14′ board in waves is just a blast. Add in some dolphins, otters, and ten other people doing the same thing and it’s like the 60’s all over again. The sun was shining, and whales were spouting and breaching along the horizon. That’s living. BONK! “Meh meh meh,” the alarm screamed in my ear with Phil sheepishly apologizing, “Um, sorry, Johnny, didn’t mean for that to happen,” for dropping his phone on my head. Minutes later five of us are in the kitchen making coffee, breakfast, and toast wondering what the weather was like. If the storm passed through overnight there’d be no south wind. When we could see the trees looked calm. No one thought about how torn up the ocean could be. “CRASH!” went the light cover as glass covered the bathroom floor. 6:32am and already I’ve had a phone on my head and now I’m standing in about a four-foot square bathroom covered in glass. I gave up, threw on Costco’s version of Uggs, my sunglasses, and twenty-two layers of clothing and headed to the race site. Poe greeted me with his huge smile wearing shorts and a tee shirt. He’s from Tahiti and doesn’t seem to understand cold. Josh was skipping around doing pre-race warmups or something of the sort. Kitsy and Alex were checking out the competition while Nico tried to figure out where the Prius was parked. With efficiency only equaled by the government we heard the course directions. The consensus was to follow the leader and hope for the best. 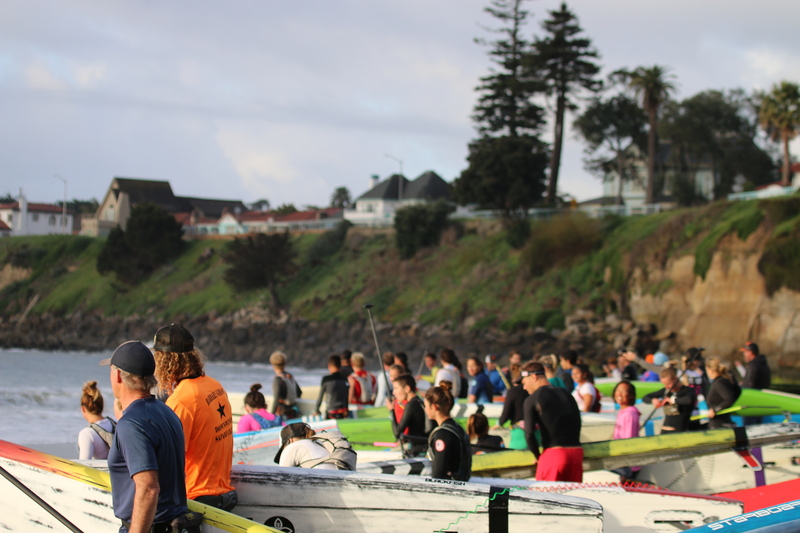 Poenaiki Raioha wearing a 2mm shorty in Santa Cruz during the event! The horn sounded, and boards splashed into the water. Last night’s wind and the building windswell created less than ideal conditions. Luckily, I had trained for just this scenario so I wasn’t tired until the second buoy turn, about a mile into it. Only five miles to go. The leaders looked set and the rest of us chased them down every so often getting a bump to ride. Sometimes we even got bumped off completely. There was a lot of swimming, what I call “cooling off,” going on. Who needs to cool off when it’s 50 degrees out? Rounding the final buoy, it was a race between Mo, Slater, and young gun Tyler Bashor with Slater coming out on top. But, oops, he wasn’t wearing a life jacket. The rules clearly stated life jackets and leashes. He was knocked out, a tough but correct call, by the organizers. Josh rounded out the top five and Poe and I took up the final spots in the top ten. Top 5 elite racers approach the end of their first lap! Nico showed some determination sneaking into a medal by taking third in the short course. 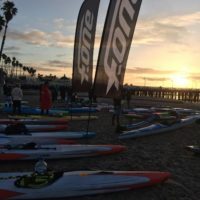 Kitsy and Alex also did the short course but commenting that the conditions were a bit tougher than home sweet home – San Diego. During this weekend there is no rest and before we could eat and relax, heats we’re starting up again this time at Indicators and the Lane. Kitsy shook off her race put on her magic smile and went out to dominate her heat. The Bluerush house was well represented at Indicators with John, Steve, and Rune showing the SoCal contingent what the NorCal crew can do. They had fantastic heats. Johnny got in some styling nose time to go with his carves. Rune was chasing down every set wave and riding to his heart’s content. And Steve, with his new Pink and Blue special, was looking like a man who slept well and knew that getting waves was the key to success. The man, the myth, the legend John Hadley! Watching up from those heats, Haakon was in the middle of his heat which was pretty much a one man show as he submitted his ballot to make it to finals day. Josh and Poe also took calculated efforts, so the judges could easily spot them by methodically dissecting the waves. 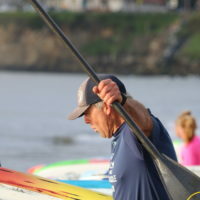 I was in the water for Poe’s heat and you could see the salt and water molecules running for their lives as he powered up his bottom turn and set his eyes upon the lip. My second heat was one for the ages, literally. 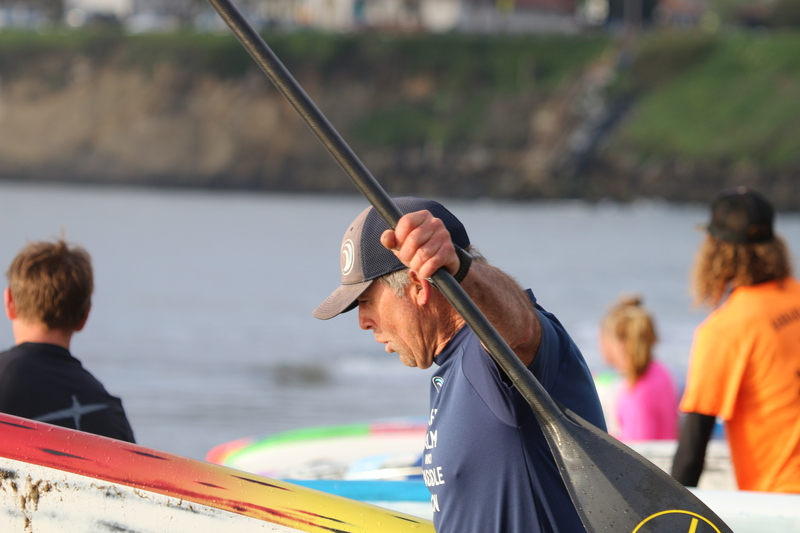 In it, Tyler Bashor and Dave Daum who are two of the youngest upstart rippers and racers in SUP, were taking on Jeff and me clocking in at the respective ages of 67 and 50. We tried to psych them out with the age difference, but kids don’t care. Dave took an easy first and somehow the judges gave me the edge over Tyler for another second. Sadly, that wouldn’t be enough to get me to finals day. Finals day dawned, as many days do, with a fantastic sunrise. Phil had woken me up again but not by dropping his phone on my head this time. We got to the site. Found a parking spot and surfed. It was a solid heat. No judges. Then the horn blew and we had to go in. Our legs were tired and finals day was on! 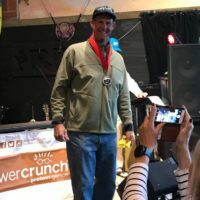 Josh, Poe, and Haakon had made the cut along with Santa Cruz legend John Alexiou and 12 others of the best SUP surfers in the world – Zane Schweitzer, Mo Frietas, Daniel Hughes, and Anthony Maltese among them. Haakon and Poe were matched up in the same heat. 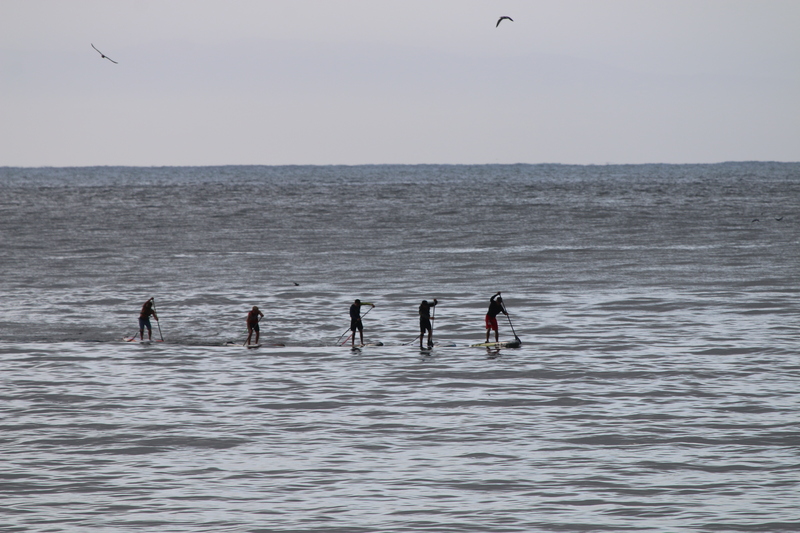 Haakon spent the first ten minutes of his heat counting kelp strands before deciding to get some waves. 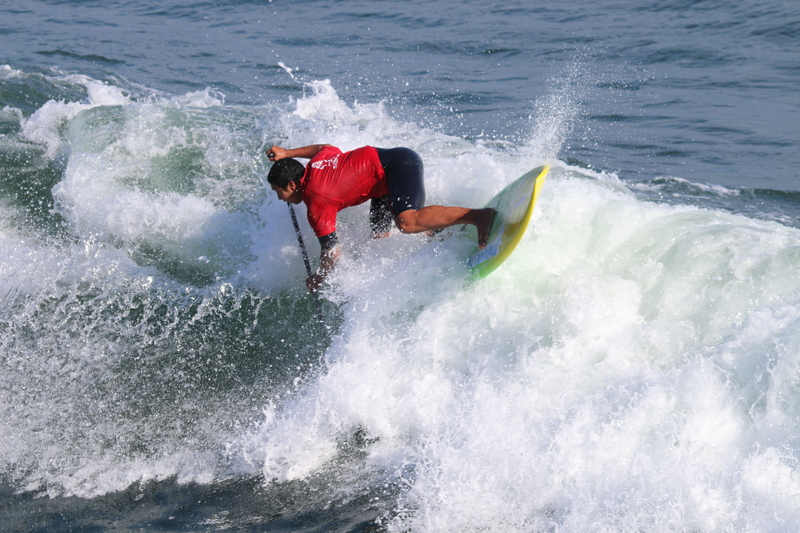 His surfing was spot on but the judges didn’t see enough to advance him which was a great disappointment except that we were able to get waves right after the final! Poe, in the same heat was watching Mo get a lot of waves and good turns in before sliding into a beauty and throwing enough spray out the back for a cool rainbow to appear. Josh started his heat off at the top ripping turn after turn after turn. He was throwing gouges like rice at a wedding. It’s a point of mystery even now how he got third in his heat. 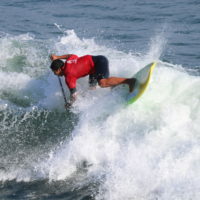 Donning a 2mm Manera spring suit in the final, Poe made his way out for his heat and sat patiently for the two waves he decided he would take. While everyone else in his heat was paddling around getting waves he had his eye on something else. Zane was playing around like it was a day at the skatepark doing moves that are still unnamed. When Poe took off even the wave gasped along with the crowd. His turns were spectacular as always but today was Zane’s day and he had to settle for second. Over at Indicators, the second heats were running and John, Steve, Rune, and Kitsy were putting up some good numbers. In the end Rune and Kitsy ended up with solid second place finishes while John Walsh ended one spot out of medal contention, but his effort was solid. 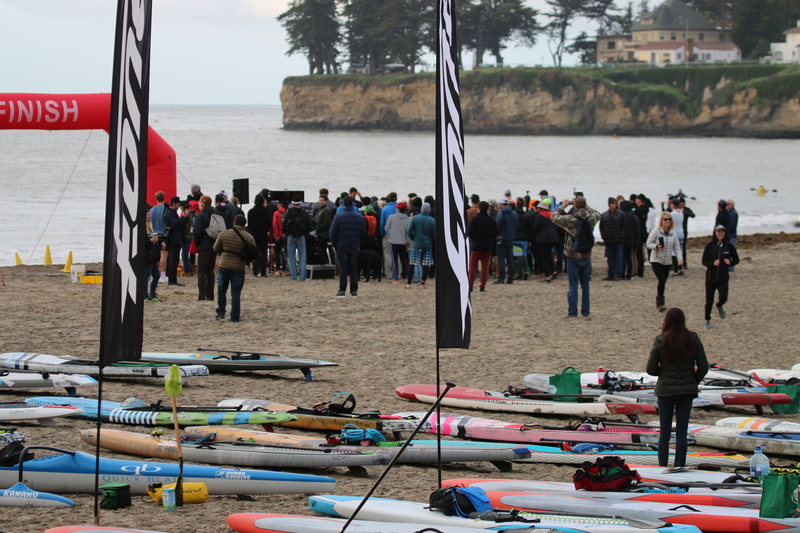 The thing with the Paddlefest is this; All you read about was the surf and race and that’s a lot. 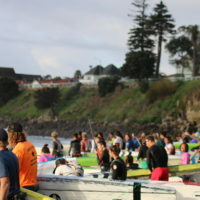 In the meantime, there are free surfs, people to talk to, kayaks to watch, new people to meet, and booths to check out. At night there are parties and dinners to attend and more opportunities to see old and new friends. In the end your placing doesn’t matter it’s how much fun was had.